The world’s most rugged design gets even more powerful with new processing system. NEWARK, N.J. — Panasonic, an industry leading manufacturer of mobile computing solutions that are purpose-built for the way people work, announced the U.S. launch of its newly upgraded TOUGHBOOK 31 laptop computer. Specifically designed for the mobile workforce, which has relied on the TOUGHBOOK brand for two decades, the TOUGHBOOK 31 offers improved safety and functionality to optimize productivity for workers in challenging and extreme environments. Upgraded with the latest Intel® Core™ i5‐7300U vPro™ processor, the TOUGHBOOK 31 is more powerful than ever before, offering peak performance, enhanced graphics, standard features such as faster 16 GB DDR4 memory and a 256GB SSD, an advanced LTE module, in addition to several additional new improvements. Offering more features for the same price, the TOUGHBOOK 31 is not only providing better value for customers, but also improving mobility, safety and optimizing productivity. Upgraded processing system: Intel® Core™ i5-7300U vPro™ improves processing performance by 19 percent and graphic performance by 42 percent. Also available is an i7 CPU. Enhanced memory module: Faster DDR4 memory module boosts system’s memory. 16GB of RAM will be a standard feature with 32GB optional. Advanced connectivity: To provide flexibility for those in manufacturing, EM7455 LTE‐Advanced is available to offer unparalleled LTE speeds, bandwidth and network performance. Also available is a dedicated GPS modem. Longer battery life: For customers who often find themselves away from power sources for extended periods of time, a second battery offers the ability to swap batteries to achieve unlimited battery life and enhanced safety on the job – an imperative for the federal government sector. Additional improvements: Updated Wi‐Fi chip, and more standard features like a 256GB SSD. Integrated options: Configurable features can be designed for mobile professionals based on industry application such as an insertable smartcard. Every device comes with a comprehensive 3‐year manufacturer’s hardware warranty covering all defects in materials or workmanship. With US‐based engineering, help desk and repair services, devices have an average turnaround time of 48 hours once received at the Panasonic National Service Center. Also, all overnight freights are paid both ways for all in warranty repairs. Additional upgraded services are available, including Premier Deployment services, 24 hour devices exchange programs, Extended Product Warranty (4th/5th year), Ultimate Care and Protection Plus (Accidental Damage Warranties), and HDD/SSD no return Warranties. Pricing and availability The latest TOUGHBOOK 31 is available this December from authorized Panasonic resellers at an estimated street price starting around $3699. 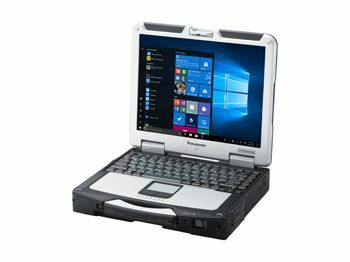 Sales inquiries for Panasonic TOUGHBOOK mobile computers and tablets should be directed to sales.psc@us.panasonic.com or 877‐803‐8492. The Panasonic TOUGHBOOK family of laptop computers, 2‐in‐1s and tablets can be followed on various social media channels, including, Facebook, Twitter (@TOUGHBOOK), LinkedIn, YouTube and our blog, Rugged Mobility for Business. Panasonic System Solutions Company of North America, Division of Panasonic Corporation of North America, delivers reliable technology solutions for government and commercial enterprises, nonprofit organizations, creative professionals and SMBs. Learn more at https://na.panasonic.com/us/. Newark, NJ‐based Panasonic Corporation of North America is a leading technology partner and integrator to businesses, government agencies and consumers across the region. The company is the principal North American subsidiary of Osaka, Japan‐based Panasonic Corporation and leverages its strengths in Immersive Entertainment, Sustainable Energy, Integrated Supply Chains and Mobility Solutions to provide secure and resilient integrated solutions for B2B customers. Panasonic was highlighted in Forbes Magazine’s Global 2000 ranking as one of the Top Ten Best Regarded Companies for 2017. The ranking is based on outstanding scores for trustworthiness, honesty with the public and superior performance of products and solutions. Learn more about Panasonic’s ideas and innovations at Panasonic.com.